The Ford Fusion is on its way out in the North American market, meaning it doesn’t make sense for Ford to keep running a Fusion-wrapped rear-wheel-drive V8 on the track every weekend in NASCAR’s top series. Ford’s bringing in the Mustang, which there are actually 10 million of, to take its place next year. Ford debuted the new Mustang on Thursday, and it looks about like you’d expect—a smoothed-down version of the production body, with stickers for headlights and racing slicks on it. The cool part is, unlike some other NASCAR cars, the street Mustang actually has a RWD V8 option. 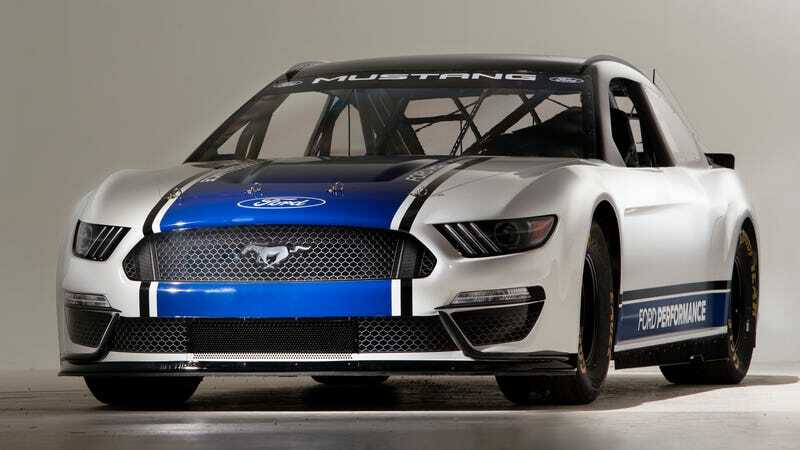 Ford announced earlier this year that the Mustang would be its new Monster Energy NASCAR Cup Series car starting in 2019, since Ford’s phasing out almost all of its cars out of the North American market over the next few years except for the Mustang and Focus Active. But in NASCAR, it’s not all rainbows and butterflies about replacing the family sedan with an actual muscle car. Ford has been dominant with the Fusions in the Cup Series this season, and according to the Detroit News, driver Brad Keselowski said introducing the car could go either way. It could be great, or it could go like Chevrolet’s Camaro ZL1 intro has this year—slowly and frustratingly. Either way, it’ll probably make things interesting.